Why the late PC release? Well, that has to do with another bundle of joy. 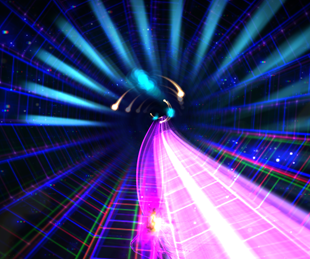 "I know that's not March," says Shawn McGrath, designer of award-winning hypnotic tunnel chasing shooter-thing Dyad, formerly a PSN release, now due out on Steam and GOG April 24th. Dyad was due to hit PC in March, but McGrath admits that date slipped past him. "I know the days in April are not the same as March," says he. "I lied. I'm a liar." Why the delay, you ask? Well, McGrath had a kid and, as it turns out, kids are a lot of work. "If you take a baby and put them beside a pillow," he says, with a bemused look on his face, "they die!" Further proof, if it were needed, that pillows are Satan's minions. Be that as it may, new kid equals less time, which pushed back Dyad's release date. Dyad is one of those hard-to-master titles that can drive you nuts, or entrance you. There's no plot, characterization or story. You race down a color-saturated track, hooking yourself onto enemies and pulling yourself forward, filling up your lance meter so you can lance your way through even faster. Obstacles abound, making this a reflex and brain-challenging title, the sort of thing you either love or loathe. McGrath wants you to buy this game. "Kids are expensive, so you should buy it to give me money," he says, gleefully chuckling that "I'm gonna totally exploit my child."